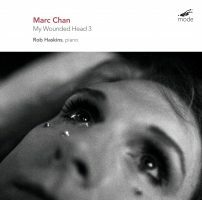 Marc CHAN: My Wounded Head 3 (2009). Rob Haskins (pno). mode 294 (1 CD) (http://www.moderecords.com/). If you like your Bach straight up, then Chan’s minimalist constellations will not amuse. The harmonizations of O Haupt voll Blut und Wunden are a powerful recurring element within the St. Matthew Passion. Chan doesn’t provide the familiar melody, but instead organizes or jumbles the chorale’s pitch materials into chowder, deeply obscuring Bach’s poignant original. Most likely Chan’s cells are derived from a phrase’s pitches or all the notes within a measure. Frequent two-against-three patterns inevitably recall Glassworks. As performer, Haskins can decide how often to repeat, what dynamics to use, and how to position Chan’s patterns into the 72-minute span. Chan’s work returns all and more of what Haskins invests. 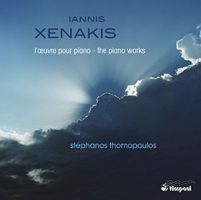 Iannis XENAKIS: Herma (1961); Evryali (1973); Mists (1981); À R. (1987); Six Chansons pour Piano (1951); Zyia (1952)*; Trois Pièces inédites (1949). Stéphanos Thomopoulos (pno), Raquel Camarhina* (sop), Matteo Cesari* (fl). Timpani 1C1232 (1 CD) (http://www.timpani-records.com/). Thomopoulos does not go over the top, producing perhaps the gentlest Herma on record. Indeed, there is a noticeable lack of aggression at those points when Evryali attempts the impossible. After the three major pieces and the characteristic but miniature À R., Thomopoulos offers castoffs including student works from 1949 when Xenakis was in Messiaen’s class and apparently had examined Bartók closely. The barbaric, meandering Zyia, for flute, soprano and piano, has a modal passage prefiguring Phlegra, suggesting that Xenakis was finding his way. The Six Chansons vary among impressionistic and folksy, decidedly out of fashion for 1951, especially considering what Xenakis would do later. We could argue whether it makes sense to play these early pieces, except that Thomopoulos’ Romantic spirit unites them all. “The Return.” Sergei RACHMANINOFF: Préludes, Op. 3, No. 2 (1892), Op. 23, Nos. 5, 6 and 7 (1901-03), Op. 32, Nos. 5, 10 and 12 (1910); Études-Tableaux, Op. 33, No. 6 (1911), Op, 39, Nos. 1, 5 and 6 (1916); Variations on a Theme of Corelli (1931). Arno BABAJANIAN: Prelude (1947); Melody (1973); Elegy (1978); Vagharshapat and Dance (1947). Raffi Besalyan (pno). Sono Luminus DSL-92187 (1 SACD, 1 Blu-ray) (http://www.sonoluminus.com/). Despite Besalyan’s robust command, there is not much to learn about Rachmaninoff in the Préludes or Études. But then again, they are just preludes and etudes. However, the Corelli Variations – actually, they should be the La Folia Variations – bear greater scrutiny. Keeping in mind the tradition Rachmaninoff himself established, Besalyan can play all 20 variations because there is no coughing. 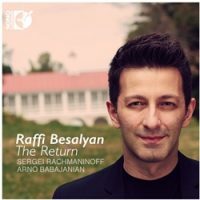 The four selections by Babajanian, an Armenian composer / pianist trained in the Russian tradition, and a natural successor to Rachmaninoff, occupy less than ten minutes. They are effusively Romantic but with unexpected colors and dissonance. The Vagharshapat and Dance is splashy and showy and the Melody and Elegy easily tuneful, reflecting Babajanian’s experience scoring films. 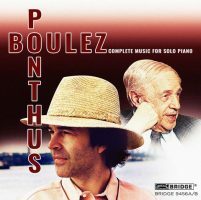 “Complete Music for Solo Piano.” Pierre BOULEZ: Deuxième Sonate (1947-48); Douze Notations (1945); Incises (2001); Première Sonate (1946); Une page d’éphéméride (2005); Troisième Sonate (1955-57). Marc Ponthus (pno). Bridge Records 9456A/B (2 CDs) (http://www.bridgerecords.com/). It requires two discs (38:50 + 41:45) for Ponthus to pull us into Boulez’s workshop. The piano was the composer’s own instrument and where he worked out some of his most experimental ideas. As we can now take stock of Boulez’s oeuvre, it’s possible to observe the obdurate becoming pliant as total serial hegemony did not come to pass. Despite the vigor and precision Ponthus brings to the three flashy and difficult Sonatas, they come off as quaint. Pollini’s madcap delivery of No. 2 remains unrivaled. The dispersed Constellations of the incomplete No. 3 interest less than Une page and Incises’ forthright return to sensuality. Tools once brandished in anger are repurposed to create cavorting sweeps of notes, and we can now appreciate that the twelve bitty Notations (of 12 measures each) contained everything. “Scarlatti:Cage:Sonatas.” Domenico SCARLATTI: Sonatas, K. 213, 141, 531, 27, 87, 175, 381, 492 (ca. 1730-57). John CAGE: Sonatas XIV & XV, XIII, XI, I, XII, XVI, V (1946-48). David Greilsammer (pno). Sony 8883762402 (1 CD) (http://www.sonyclassical.com/). 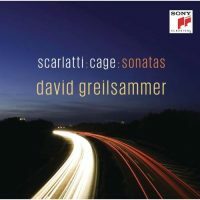 In Greilsammer’s interleaved sequence, Scarlatti and Cage’s sonatas follow each other attacca and so the prepared piano’s gamelan timbres can appear suddenly over Scarlatti’s resonance. Greilsammer robustly emphasizes Spanish touches as in K. 141, 27 and 492, where castanets and extra notes creating emphatic clusters are not far away. The keen ear will hear subtle rhythmic changes in familiar sonatas, such as in K. 381, the E-major sonata with the trumpet fanfare. I don’t recall hearing Cage’s sequence broken up and excerpted before now. Both Cage and Scarlatti used binary form in their sonatas, but such design is obscured in Cage’s percussion ensemble imitation. Greilsammer takes his Scarlatti in a Romantic manner whereas his Cage is parsimonious and rarely gritty. The preparations are quite focused compared to others, such as Louis Goldstein’s complete traversal on Greenseye Music 4794, which is appropriately hazy with vintage edges. 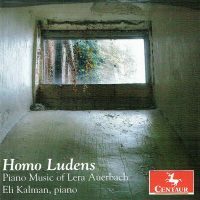 “Homo Ludens.” Lera AUERBACH: Images from Childhood: 12 Character Pieces for Piano (2000); 24 Preludes, Op. 41 (1998); Ten Dreams (1999). Eli Kalman (pno). Centaur Records CRC 3441 (1 CD) (http://www.centaurrecords.com/). In total, these 46 short pieces in three cycles offer a full view of Auerbach’s pianistic gambit. There is a carefree, improvisational feel to this music, as if it was set down without revision or reflection, despite reappearing motives and themes. These pieces could complement a Shostakovich or Pärt program, replacing irony with mysticism and a touch of petulance. The Childhood set is slightly Schumannesque, but given Auerbach is an accomplished pianist, I hear Mussorgsky as well (No. 2, What a Story) and in the Preludes (No. 24 in D minor, Grandioso). The Preludes traverse through all the major and minor keys, but I was fooled by the somber hues of the odd-numbered, major-key preludes. The Ten Dreams are freer, permitting pastiche, including a passing Beethoven appearance in No. 5. I prefer Kalman’s straight-ahead approach over Auerbach’s own (BIS 1462 with the Preludes and Dreams). Robert Nathaniel DETT: Magnolia (1912); In the Bottoms (1913); Enchantment (1922); Nepenthe and the Muse (1922); Cinnamon Grove (1928); Tropic Winter (1938); Eight Bible Vignettes (1941-43); After the Cakewalk (1900); Cave of the Winds (1902); Inspiration Waltzes (1903). Clipper Erickson (pno). Navona Records NV6013 (2 CDs) (http://www.navonarecords.com/). Erickson introduces us to a remarkable American composer, unfairly forgotten. 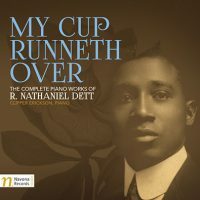 Born in Canada but educated in the US, Dett (1882-1943) became the first African American to graduate from Oberlin College with music degrees. Spiritual and popular music are but one influencing vector. There are similarities to Grieg and Grainger, but Dett’s keyboard fluency shows that Chopin and Liszt are clear models from a pianistic standpoint and Bach and Beethoven from a structural and contrapuntal mien. An orchestral palette is conjured in the Barcarolle from In the Bottoms. By comparison, Enchantment becomes abstract, even impressionistic. Halt before the developments and the straightforward tunefulness resemble Satie. In the Ritmo moderato e con sentimento, Quasi Gavotte of Cinnamon Grove Brahms crosses paths with Grieg. The latest pieces reveal a development and perhaps frustration with predominant tonal styles. The “suites” raise the question whether Dett was avoiding larger structures or sonata form, although Cinnamon Grove’s four movements do suggest a sonata. Tropic Winter will embed easygoing pieces (Pompons and Fans – Mazurka, Parade of the Jasmine Banners) among dissonant and atmospheric statements (A Bayou Garden). Tropic Winter could be programmed alongside Debussy’s Images or Préludes for powerful effect. The Eight Bible Vignettes are more severe as befit their subject and chromaticism is used for emphasis. In I am the True Vine we hear contrapuntal work no different from the Brahms Chorale Preludes. The three pieces that close the program (After the Cakewalk, Cave of the Winds, and Inspiration Waltzes) are Dett’s earliest credited works: two sparkling ragtimes and a string of relaxed waltzes.